Peptide-based pharmaceutical technology requires the delivery of therapeutic oligopeptides as designed in a stable form for effective application. Downstream from therapeutic peptide isolation or synthesis, peptides are often subjected to HPLC purification, synthetic modification, and preparatory treatments for long-term storage. Spoilage in the form of aggregation, degradation, or oxidation can occur during any of these processes. Using ARGEN (Aggregation Rate GENerator), a user can correlate spoilage modes to changes in molecular weight. These correlations are generated continuously and concurrently with up to 15 other samples to rapidly survey a process for conditions leading to optimal product quality. In this study, ARGEN was used to analyze spoilage which caused increases in molecular weight due to aggregation or association. Specifically, this application note discusses measures of stability, time to dimer (TD), and time to tetramer (TT), and it is important to note that stable peptide products have very long TD and TT values. Human insulin (Sigma I2643) was dissolved in acidified deionized water to concentrations of 2 mg/mL. After dissolution, the pH was adjusted with 0.1 M HCl and 0.1 NaOH to pH 4.3. Each sample was loaded into a disposable polystyrene cuvette and held at a constant temperature for up to 48 hours (Table). Insulin showed easily observable aggregation over a 48-hour period, as depicted in Figure 1. Insulin aggregates similarly to larger polypeptides previously studied by ARGEN, forming a milky solution after sufficient time passes. At 50 °C, the study’s lowest thermal condition, insulin remained somewhat stable with a low aggregation signal for 24 hours. In contrast, samples held at higher temperatures showed exponential aggregation. 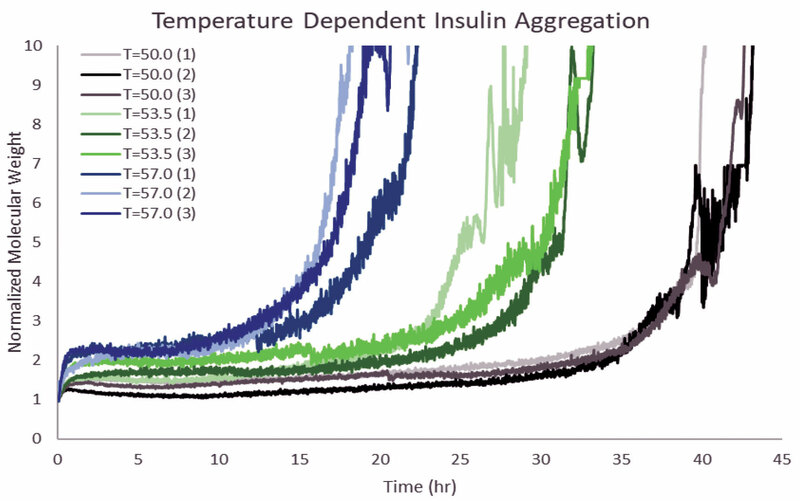 Aggregation kinetics of insulin incubated at 53.5 °C indicated there was a temperature-dependent destabilization. Further destabilization occured as the temperature increased to 57.0 °C. Kinetic data revealed the formation of metastable dimers in some samples after the initial heating. In the most thermally stressed samples, these dimers existed with little aggregation for several hours before aggregating to high-molecular-weight species. In less-stressed samples, the metastable species existed for at least 24 hours before forming high-molecular-weight species. Analysis of kinetic data reveals two interesting measurements: time to dimer and time to tetramer. As aforementioned, several samples quickly achieved a population of metastable dimers (Figure 1). The high-temperature sample was the quickest to achieve this population. The other samples did not form a population of metastable dimers, but they held samples with scattering signals higher than the monomer population (Figures 1 & 2). Because aggregation rate (AR) is normally determined from the TD, the AR measurement for the high-temperature sample was inflated when compared to the other samples that did not show the existence of the metastable dimer population in their kinetic curves (Figure 2). Figure 1. Insulin aggregates with Arrhenius-like kinetics for 48 hours. ARGEN observed a monotonic relationship between stability and temperature. Samples at 57 °C (blue) were less stable than samples at 53.5 °C (green), which were less stable than samples held at 50 °C (black). Interestingly, many samples formed metastable dimer populations that existed for several hours before aggregating to higher-order multimers. To better understand the stability of each sample, TT is used to calculate an AR, as shown in Figure 3. This measurement is a better reflection of each sample because it is independent of the formation of a metastable population. TT and the AR value derived from it reflect the speed at which nuclei for higher-order aggregates are becoming ubiquitous in solution. The necessity of this measurement is not obvious without the time-dependent, normalized, molecular weight curves. For the three thermal conditions in this experiment, the ARs derived from TT showed an exponential relationship where increasing temperature exponentially increases AR (Figure 3). Figure 2. As temperature increases, time to dimerization decreases. 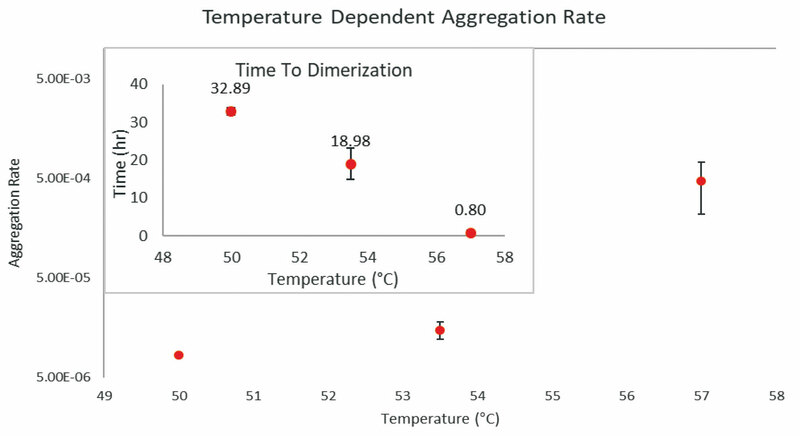 The related measure, aggregation rate (AR), increases with respect to temperature. Figure 3. There is an approximately linear relationship between temperature and TT. This is reflected in the exponential relationship between AR and TT. This AR is different from the AR calculated from time to dimerization because it is blind to the rapid formation of metastable dimers; instead, it is based on the formation of unstable, higher-order aggregates which act as nuclei for further aggregation phenomena. In this study, ARGEN is used to continuously monitor a vital peptide-hormone-based pharmaceutical. 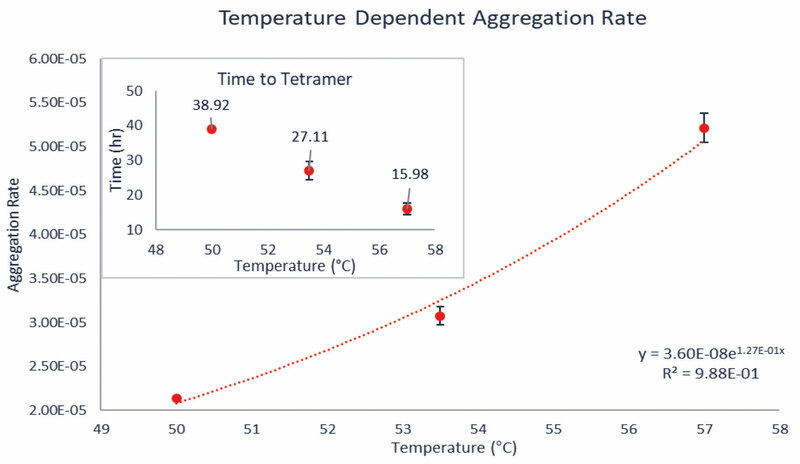 ARGEN demonstrates its utility in studying thermally induced peptide aggregation and the value of kinetic stability measurements when investigating protein and peptide aggregation phenomenon. The results of this experiment are intuitive, with increases in temperature causing faster aggregation. However, the observation of metastable populations would have been impossible without ARGEN’s continuous monitoring. This study highlights the benefits of continuous monitoring yielding real-time data. Further studies with ARGEN can investigate the effects of formulation conditions, storage conditions, or contaminant stressors on peptide stability. Michael Drenski (michael.drenski@fluenceanalytics.com) is chief technology officer at Fluence Analytics.